With 130mm of travel front and rear, the Kona Tanuki Deluxe is short on travel compared with many of its sub-£2k peers, like the Lapierre Zesty 214, Norco Sight 3 and Vitus Escarpe 1. However, weighing in at just 12.8kg it’s also the lightest — a full 1kg less than the Lapierre. Made from custom-drawn 7005 Race Lite aluminium tubing, the Tanuki is one of the sleekest bikes we’ve seen from the Canadian brand. Smooth welds around the tapered head tube give a seamless transition to the beefy triangulated upper section of the down tube that squares off towards the traditional BB shell for an improved weld contact area. Cable routing is neat up front, tucked under the teardrop-shaped top tube, but gets more unruly over the suspension rocker link. In fact, the overly long rear brake hose bulges out as the suspension compresses and rubs on the inside of your left leg. Extra line guides on the non-driveside box section chainstay are the result of shared components with the Tanuki Supreme, where the rear brake runs along the down tube to free up a slot in the top tube routing for a dropper post remote. Kona uses bushings for the main and dropout pivots with cartridge bearings in the rocker link. With the shock removed, the linkage isn’t quite as smooth as a full bearing set-up, but you’d be hard pushed to describe the difference as stiction. The shock? Kona’s in-house Fastrax AF2 with rebound adjustment and lockout. It’s quite heavily damped and we ran the rebound adjuster full open. Up front, the Solo Air sprung RockShox Sektor fork isn’t on a par with the Revelations found on the Vitus and Lapierre, but it’s easier to set up as there’s only a positive air valve to adjust: the Solo Air design automatically adjusting the negative spring to suit. Lightweight, narrow Easton rims definitely give the Kona zip, as do the silky smooth Easton hubs. Freehub engagement is no match for the Fulcrum wheels on the Vitus, though. Also, steel bead Maxxis Ardent tyres add roughly 70g of rotational weight per wheel to those lightweight XC rims! Shimano’s latest DynaSys 3×10-speed transmission, with its 11-36t cassette and closer ratio 42/32/24t rings, means you’ve got the gearing to grind up any mountain. If keeping the chain on is also a priority it’s worth noting that there are no ISCG tabs on the Kona’s BB. Fortunately, the Shimano BB has one drive-side spacer so you could always use a BB-mounted guide. Before doing that, though, the bike’s crying out for a rubber chainstay protector. Other than the 90mm stem being too long and a tad high, due to the 20mm conical headset bearing cover, all the finishing kit on the Tanuki is on the money. Available in a whopping seven frame sizes (four more than the Vitus), we chose the 18in bike, as it’s slap-bang in the middle of the size range. Once we swapped the 90mm stem for a 70mm, the Tanuki fitted our 5ft 10in test riders like a glove. While the suspension doesn’t feel as plush or sophisticated as some (the fork has a faint hydraulic tap when topped out) the Kona has a very balanced suspension response front and rear. 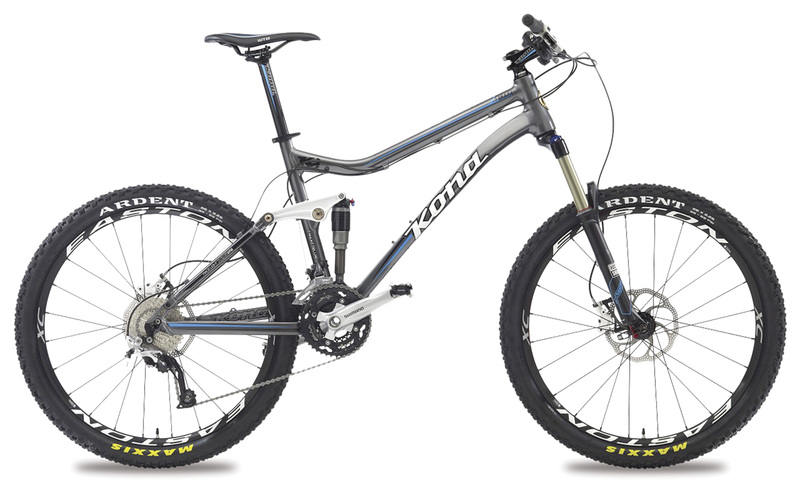 Combined with its excellent weight distribution and sizing, you have a 130mm bike that is super-easy to shred. Yes, you take a bit more of a beating on the descents, but it doesn’t seem to be any slower than the 140mm bikes here. The reward being that the Tanuki is quicker than the other bikes on the climbs. So if you live for long, epic rides, the Kona would be your best companion from this bunch. With 130mm of travel, the Kona Tanuki Deluxe is fighting the trail bike battle on two fronts. On the one hand, it’s trying to stave off the ultra-competitive, lightweight 120mm rippers, such as the Specialized Camber and Ghost AMR. On the other, it’s clawing its way to being as capable as the more solid 140mm bikes in this test. Good geometry and sizing ensure it’s holding that middle ground well, but we’d like better small bump sensitivity from the Kona rear shock. Kevlar-bead tyres and a shorter stem would also help shore up the Tanuki’s go further, faster stance.